Police Commission Chairman Stuart Sawabini discusses the possibility of installing parking meters on Elm Street during a meeting at the New Canaan Police Department, New Canaan, Conn., Wednesday, Oct. 15, 2014. As town officials continue discussing solutions to New Canaan's decades-long downtown parking issues, one possible step may again be revisited -- installing parking meters on Elm Street. 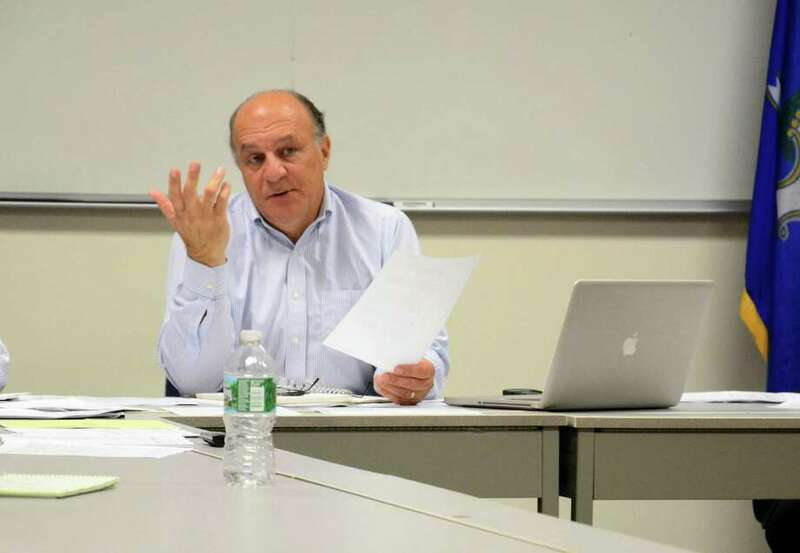 "The real solution," Parking Supervisor Karen Miller told the Police Commission Wednesday might be to mirror Greenwich Avenue and charge for parking on Elm and Main streets, while charging less or not charging at all at the metered parking lots. The topic came up as the commission discussed a recent proposal to limit parking on Elm and Main streets to one time per day. As the Parking Commission did in September, police commissioners discarded that proposal. "I don't sense a strong motivation to change the status quo," Police Commission Chairman Stuart Sawabini said, noting that he would like to hear more suggestions from the Parking Commission. Miller said she, too, did not support the once-per-day parking restriction because it could affect residents who have a routine of visiting downtown multiple times a day. The top cause of New Canaan's parking crunch, according to several town officials, is a common practice among downtown employees who trade their spots several times daily to avoid a ticket. Miller calls the practice a "sophisticated game of musical chairs." The time limit for on-street parking in the busiest areas of Elm and Main is an hour and a half. A 2007 downtown study suggested installing parking meters on Elm to crack down on the practice, but Miller said town officials rejected the idea because "it's not village-y." The study called it "a paradox" that the most convenient parking is free of charge while remote parking lots, such as the Locust lot, require a fee. Therefore, the study notes, there is no incentive for downtown employees to use the remote parking lots, which would free up space for shoppers on Elm and Main streets. "The town does it completely wrong," Miller said. "The parking that's a prime parking is free and the parking that is less convenient you have to pay for it. It's supposed to done the other way." A "universal problem," she added, is that people just don't want to walk. One recent example, according to Miller, was a deal between the town and Town Hall contractors allowing them to park at the New Canaan Historical Society, 13 Oenoke Ridge Road, just up the hill from the construction site. However, she said, parking enforcement officers see only about four vehicles or so parked there on any given day while the number of workers can reach 50. Resident Terri Hott, who was attending the meeting, suggested encouraging businesses to mandate their employees to park at a parking lot and not on Elm or Main streets. "I moved from Birmingham, Mich., which is very like New Canaan," she said. "We had the same issue, but what I did, because we owned a hair salon, we made it mandatory for our employees (that) they had to park in the parking lot and if they did not park appropriately so our clients could park, because we lost business, then they would be sent home for the day and they lost a day's pay." Miller projects that at least 70 percent of vehicles found on Elm during business hours are owned by downtown employees. "I think that if employees could get off the street, there would not be a parking problem," she said.